Active8 Robots have once again teamed up with Deloitte to demonstrate how industry 4.0 can work in harmony with the Internet of Things, at AWS re:Invent 2018 in Las Vegas. The ability to connect manufacturing equipment to a Web-based network and derive substantial value from these connections is more practical and compelling than ever. Although we are in the early stages of this development, many of the foundations are in place. It’s imperative that manufacturers take head when it comes to recognising what this combination of industrial and technological improvements could do for them. Through implementing cobots which collect big data, manufacturers will open themselves up to much better decision making opportunities. Through collecting data and understanding the results more fully, strategic objectives and benchmark performance can be more easily achieved. Decisions will begin to be based on knowledge and wisdom instead of theory and guesswork. Our simple “Duck Shy”, works through allowing attendees to join an online queue in order to take turns at playing the game. It very simple demonstrates how, through an online platform, a cobot can be controlled using the internet. It’s a tiny little taster of the future of Industry 4.0 and allows players to engage with a cobot in a way that is meaningful to them, outside of the manufacturing business. 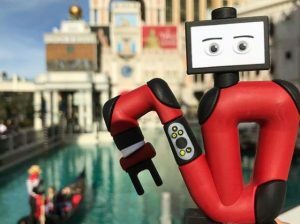 Follow us on twitter @active8robots to keep up to date with our time in Las Vegas.